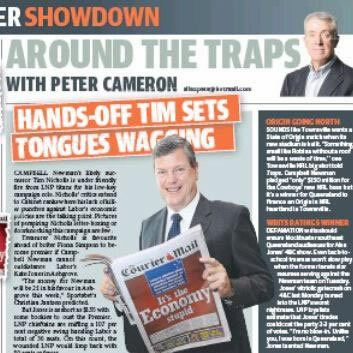 The Courier Mail was named the PANPA Newspaper of the Year for 2014. 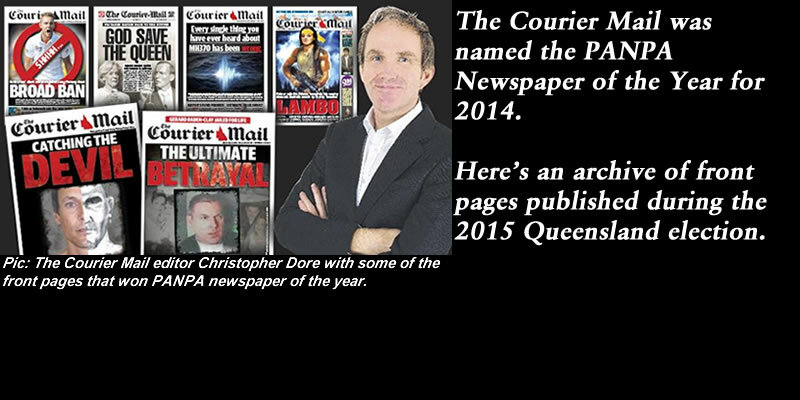 On August 22, 2014, The Courier Mail wrote, “THE Courier-Mailwas (sic) last night crowned Australia’s metropolitan daily Newspaper of the Year at the prestigious PANPA industry awards”: Courier-Mail wins Newspaper of the Year 2014 at PANPA awards. 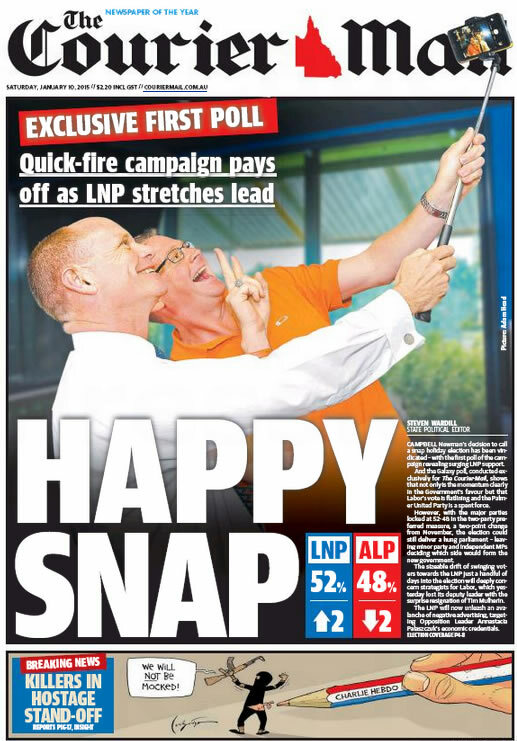 30/01/15 The Courier Mail editorial – Newman-led LNP the only credible choice for a prosperous Queensland. 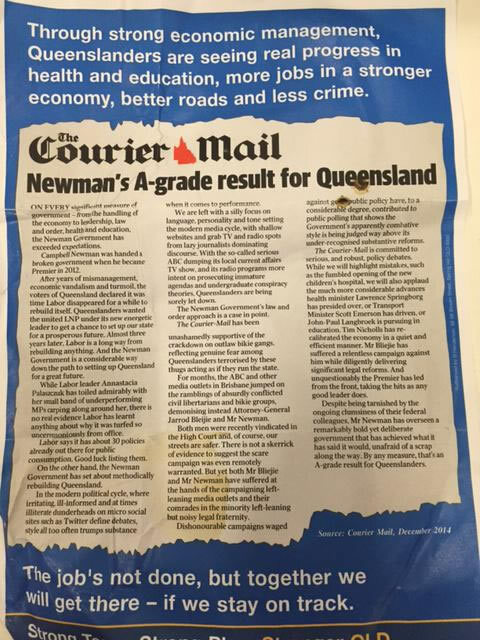 15/12/14 The Courier Mail editorial converted into a LNP letterbox election flyer. 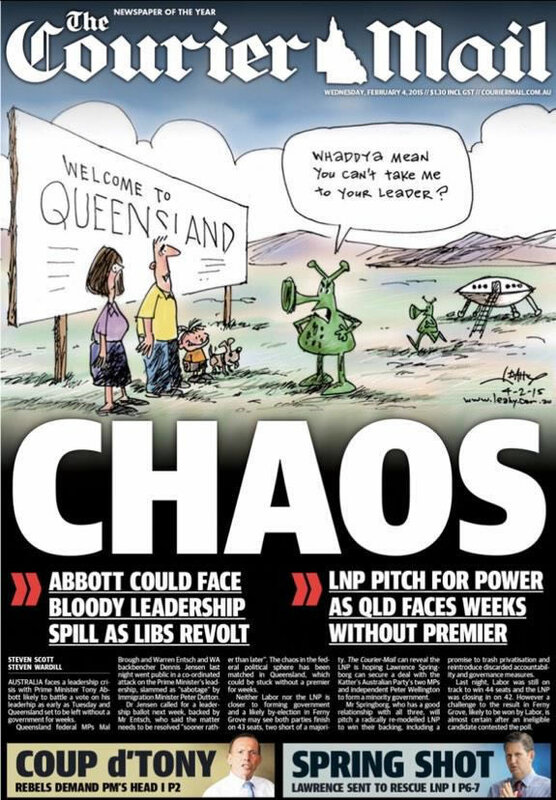 “Recipe for Chaos”: A LNP advertisement uses two of The Courier Mail front pages. 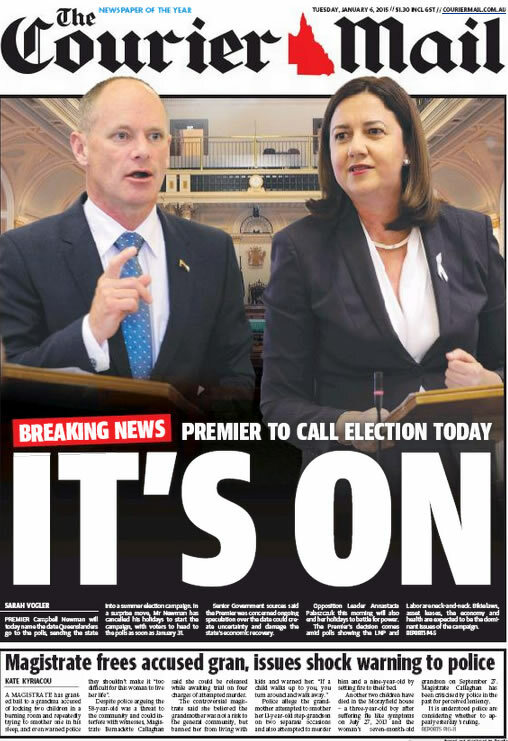 9 News Brisbane: Qld Treasurer Tim Nicholls poses with an enlarged Courier Mail front page for the media. 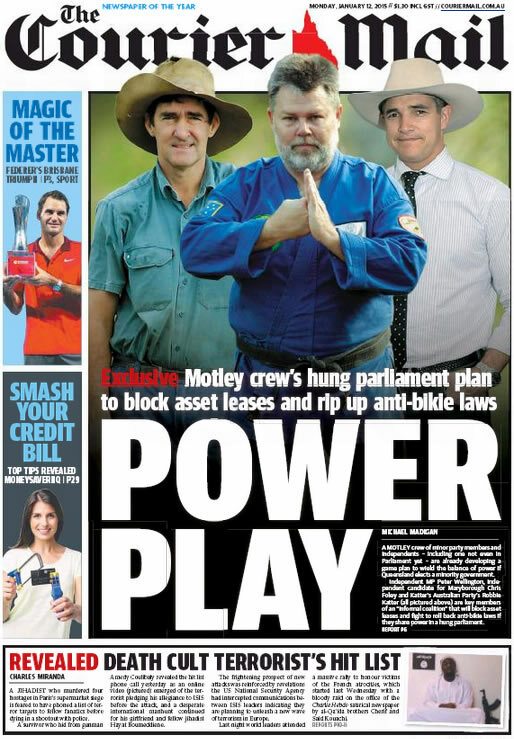 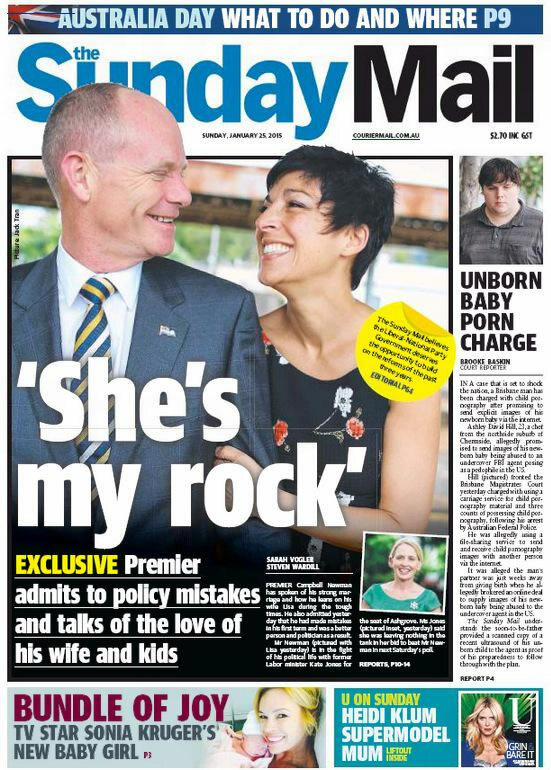 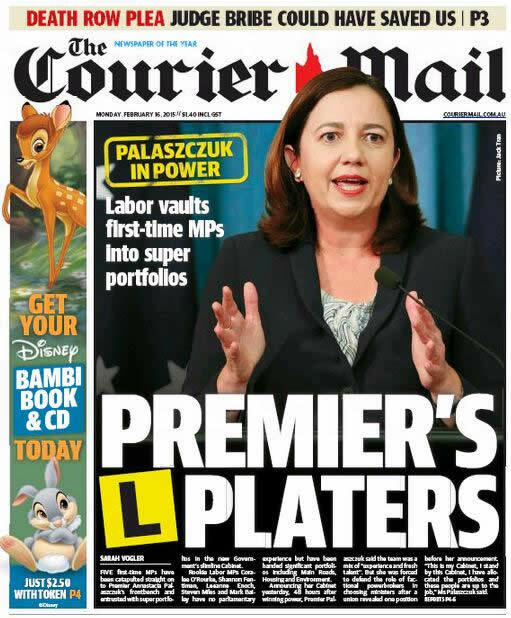 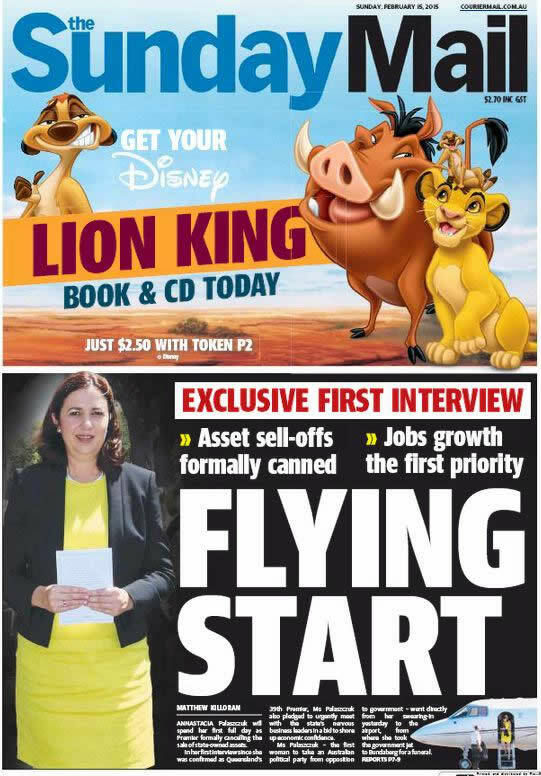 16/02/15 The Courier Mail – Labor vaults first-time MPs into super portfolios – Premiers L Platers. 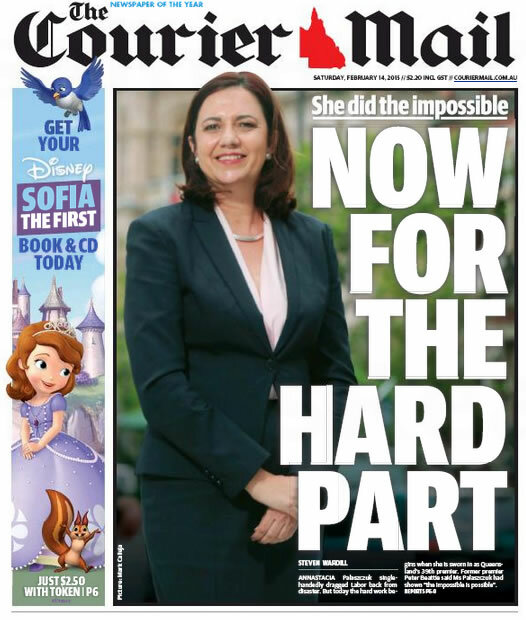 14/02/15 The Courier Mail – She did the impossible – Now for the hard part. 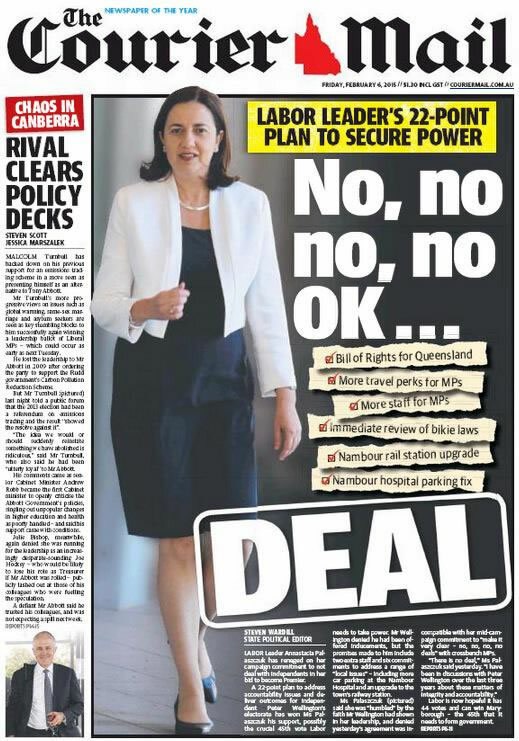 06/02/15 The Courier Mail – No, no, no, no OK… Deal. 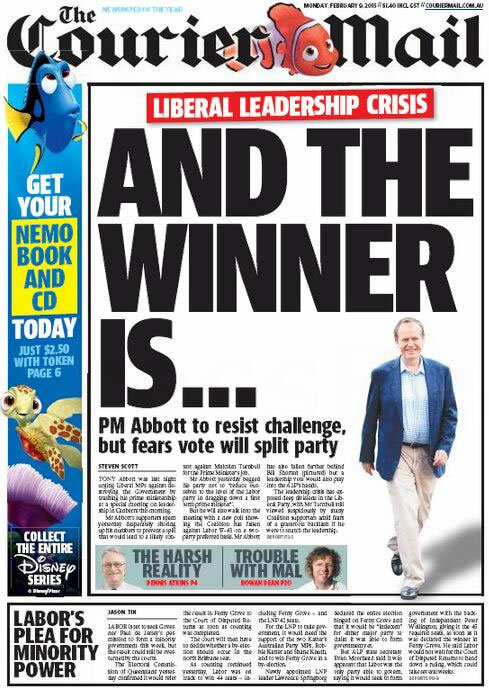 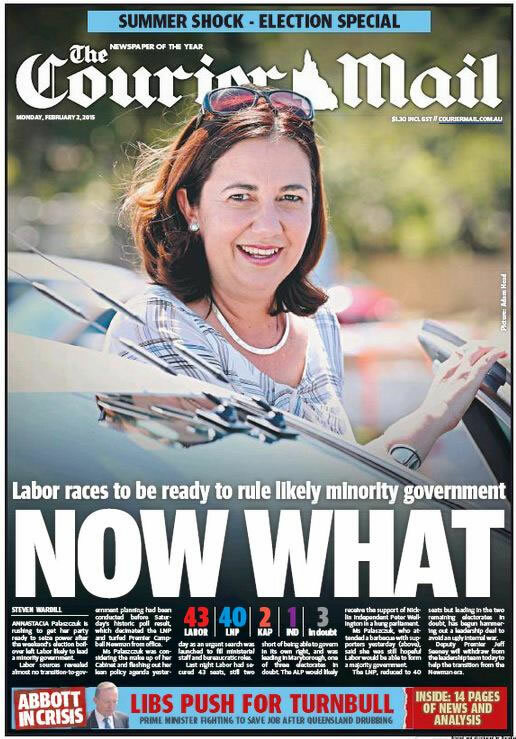 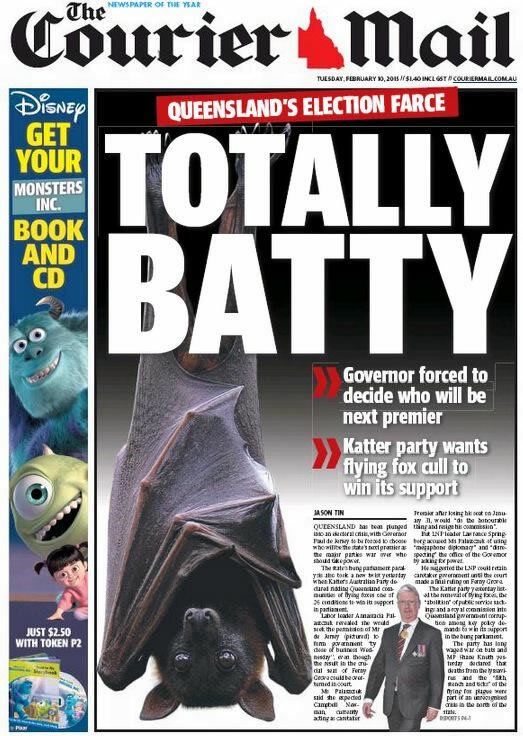 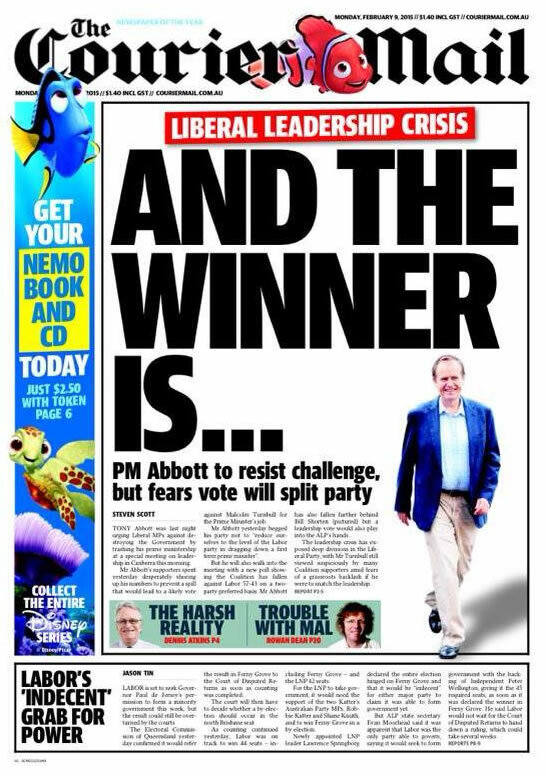 02/02/15 The Courier Mail – Labor races to be ready to rule likely minority government – Now What. 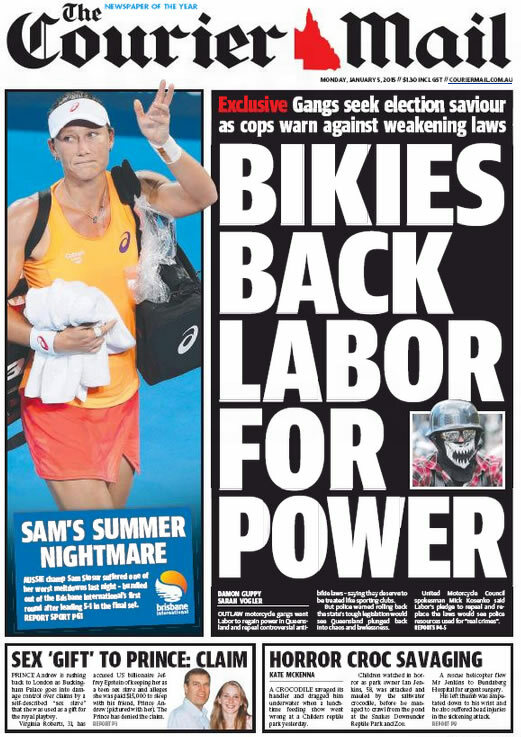 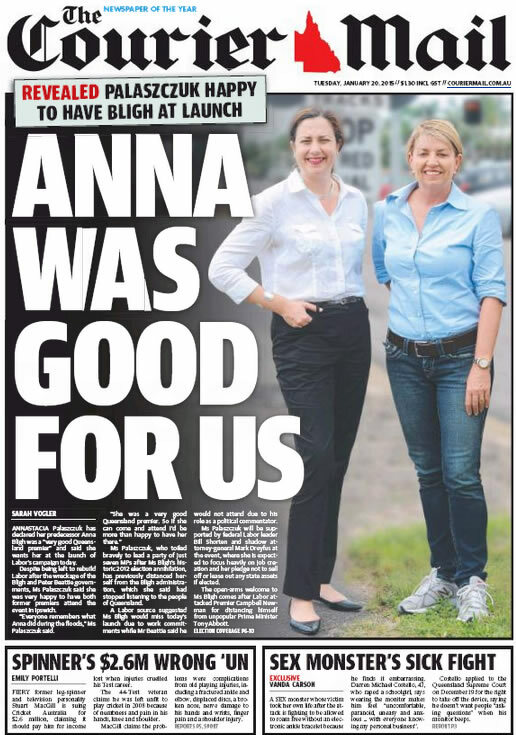 01/02/15 The Sunday Mail – Back-from-dead Labor blasts LNP from power – Annastasia Miracle. 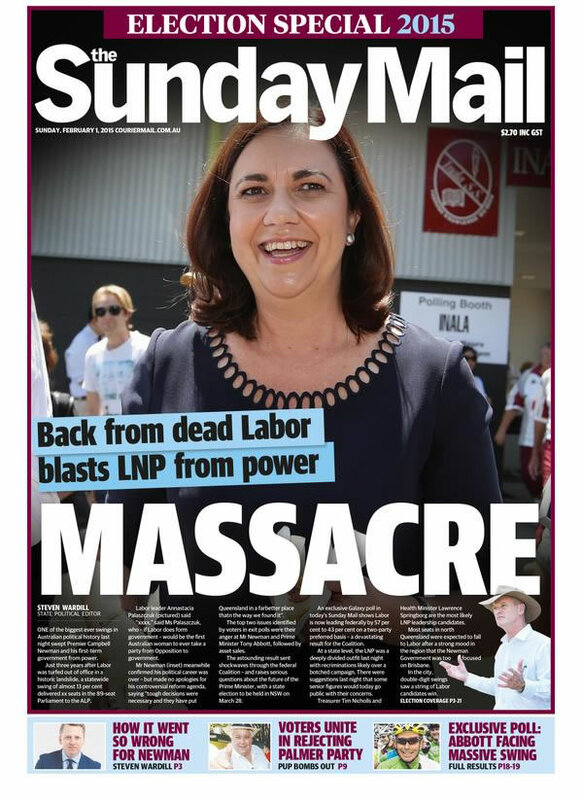 01/02/15 The Sunday Mail (2nd Edition) Back from dead Labor blasts LNP from power – Massacre. 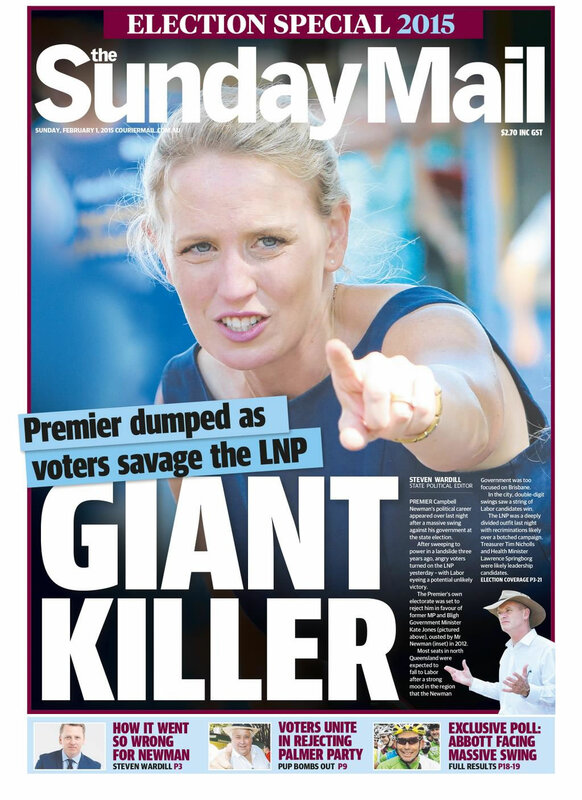 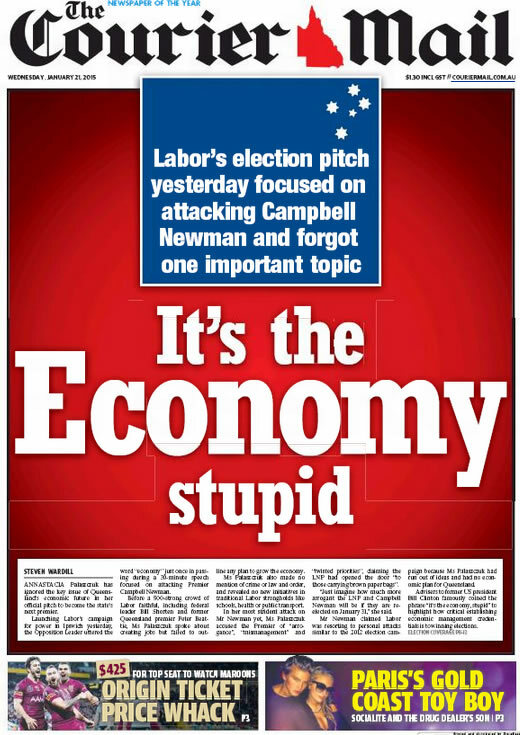 01/02/15 The Sunday Mail (1st Edition) – Premier dumped as voters savage the LNP – Giant Killer. 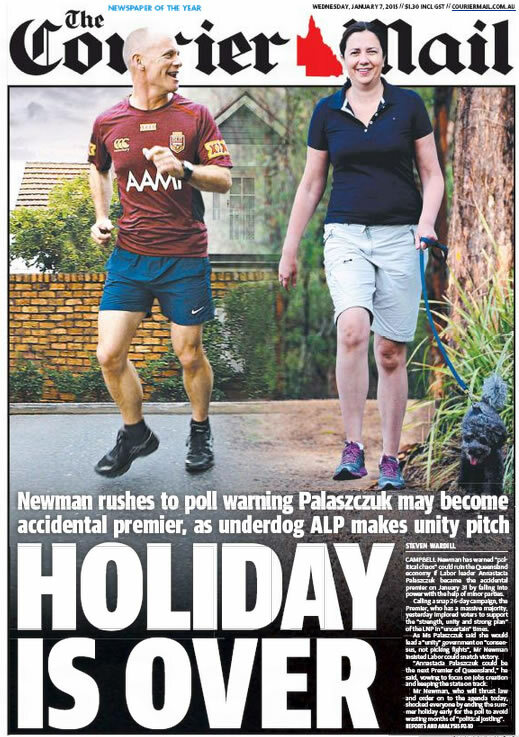 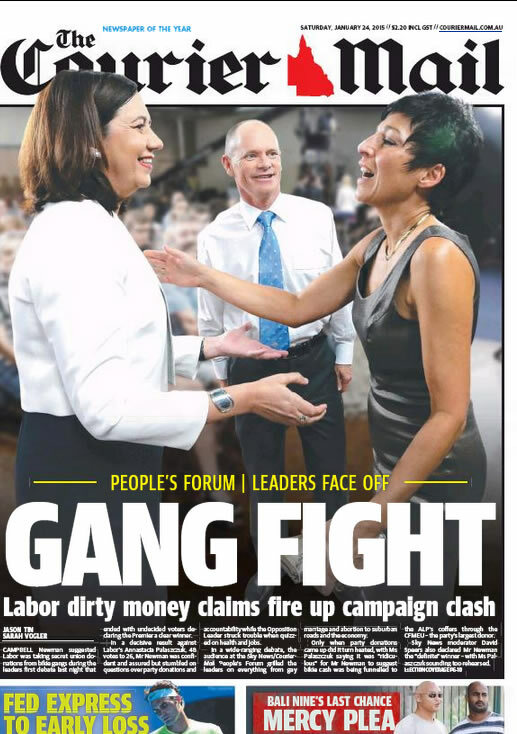 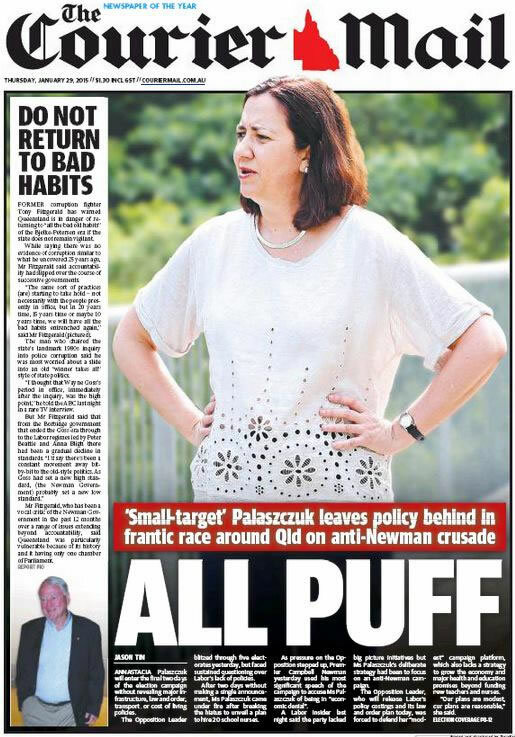 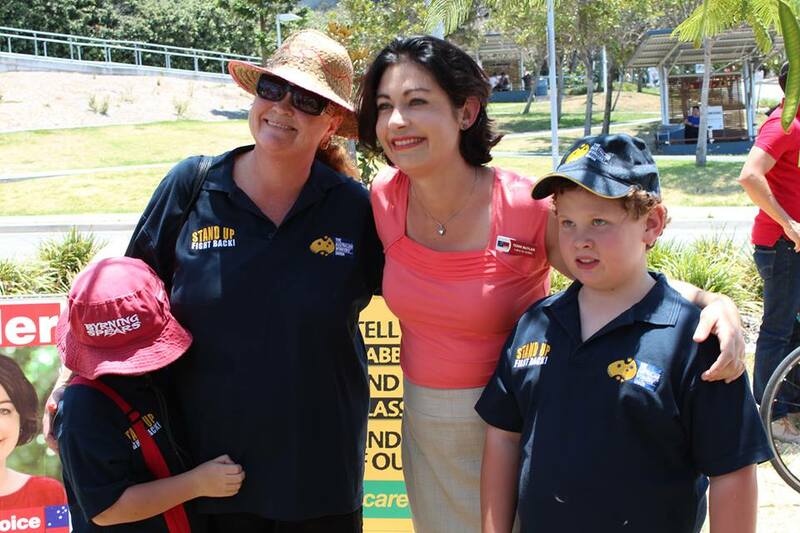 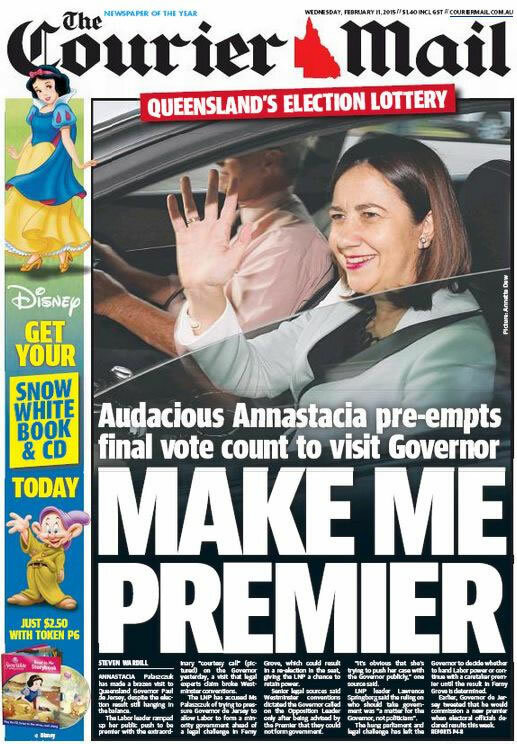 29/01/15 The Courier Mail – ‘Small-target’ Palaszczuk leaves policy behind in frantic race around Qld on anti-Newman crusade – All Puff. 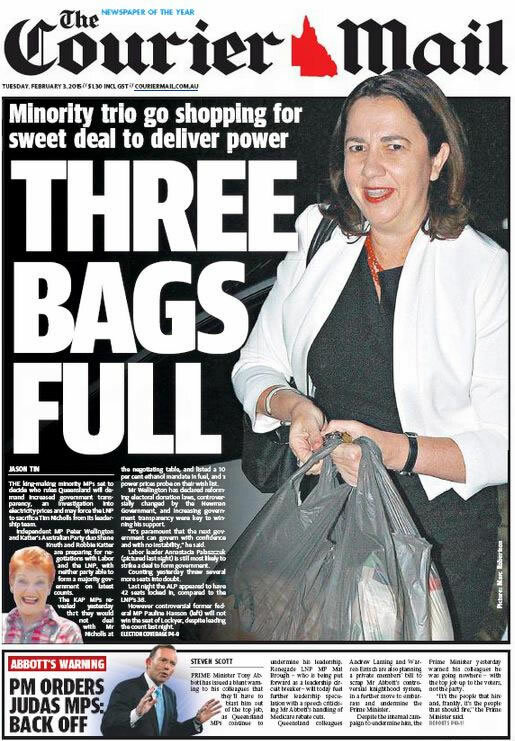 28/01/15 The Courier Mail – LNP unveil cash stash for voters. 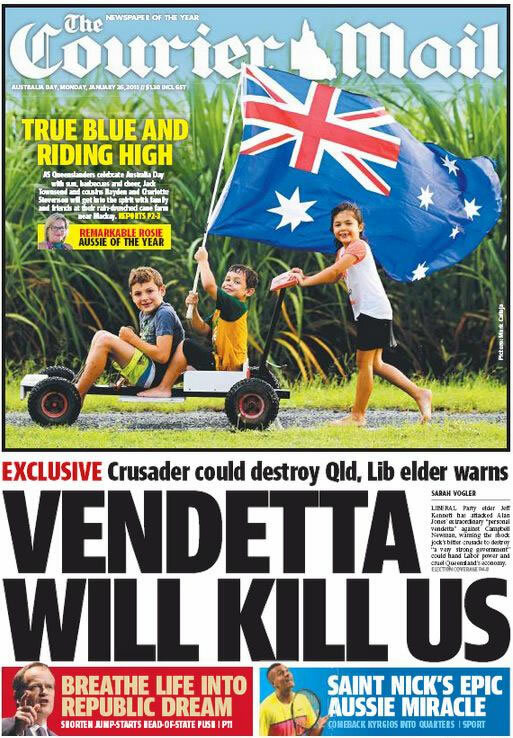 26/01/15 The Courier Mail – Exclusive Crusader could destroy Qld, Lib elder warns – Vendetta will kill us. 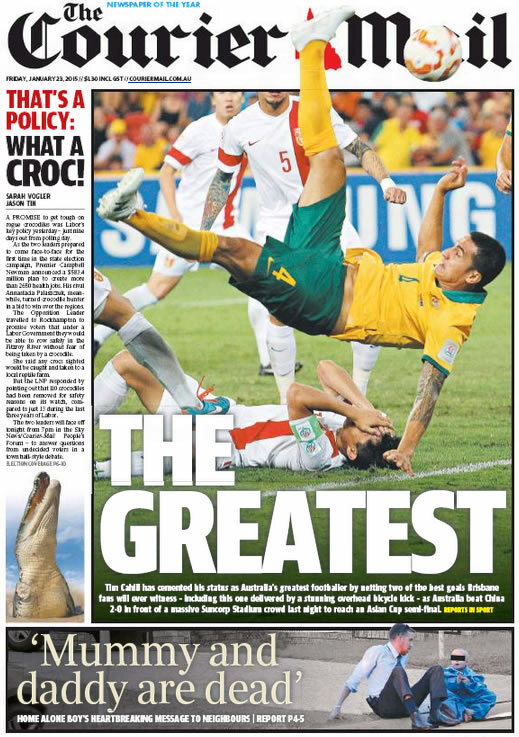 23/01/15 The Courier Mail – That’s A Policy – What A Croc! 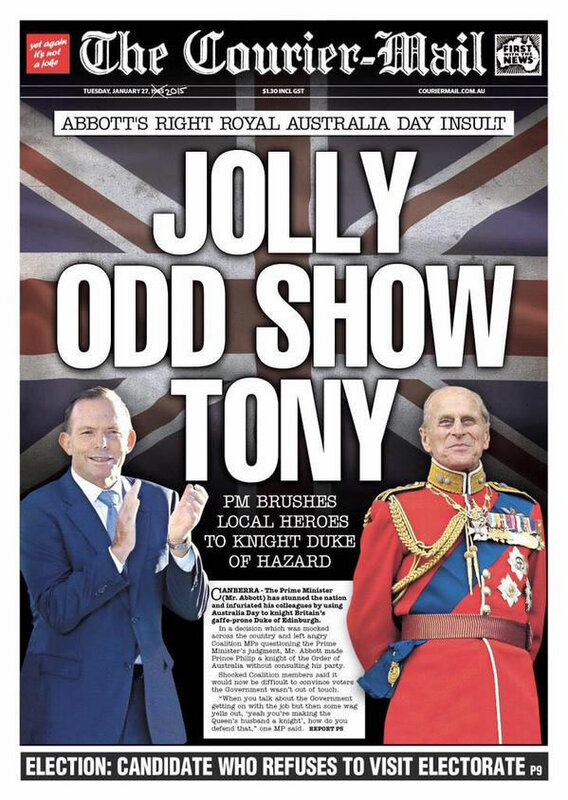 Disgraceful bias, misinformation and misuse of power by Murdoch lickspittles . 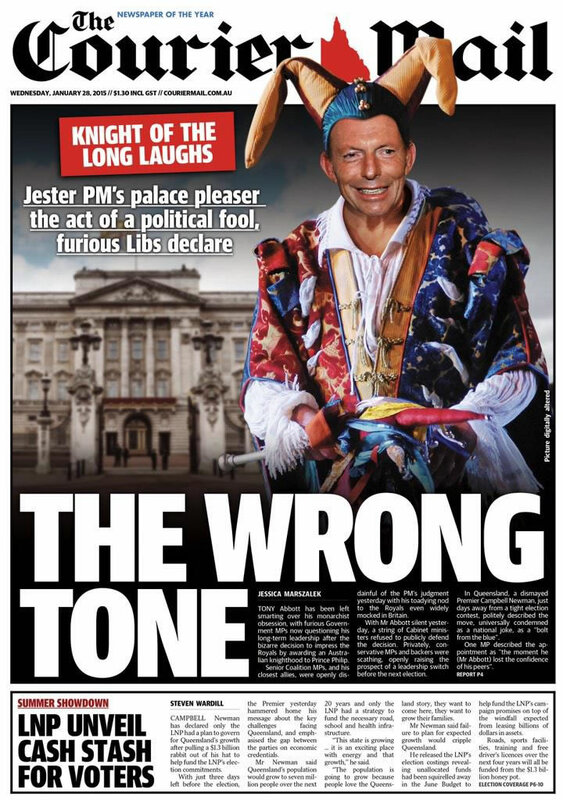 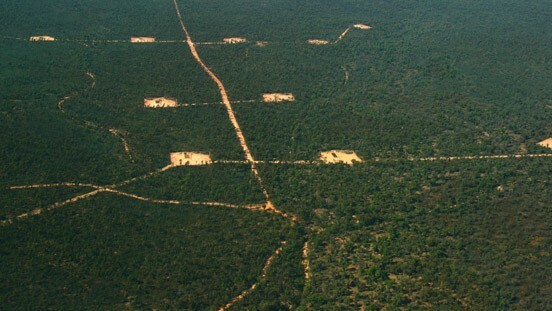 We live in a Murdochracy, not a Democracy. 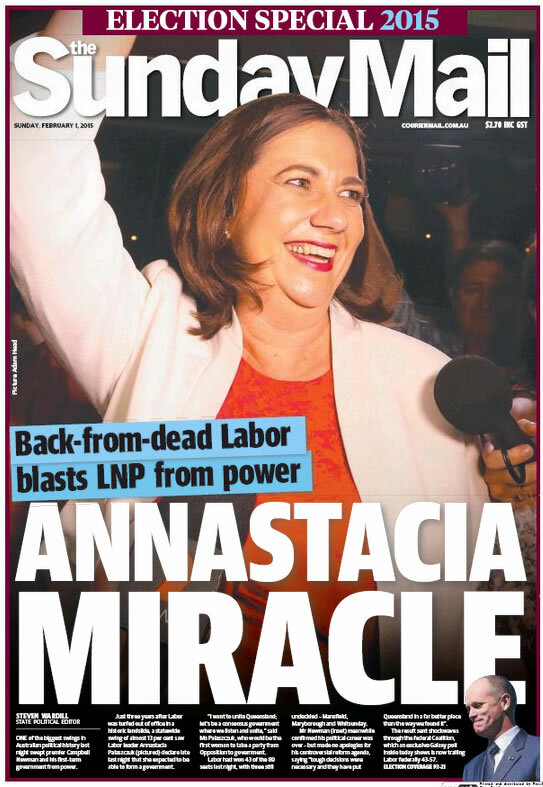 Really there’s no reason for anyone to buy the Courier Mail, of the Sydney Daily Telegraph or The Australian, or watch Fox News, or any of the tripe Murdoch produces. 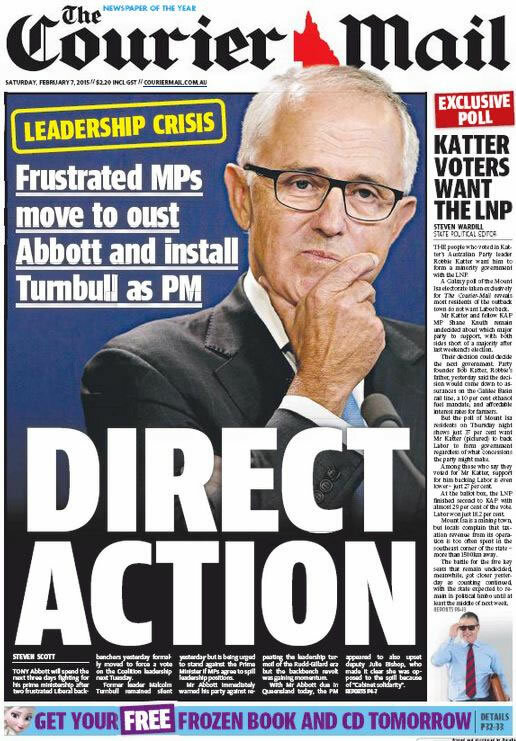 Murdoch made a conscious business decision that he would only produce right wing propaganda (unfortunately they are still called “newspapers”). 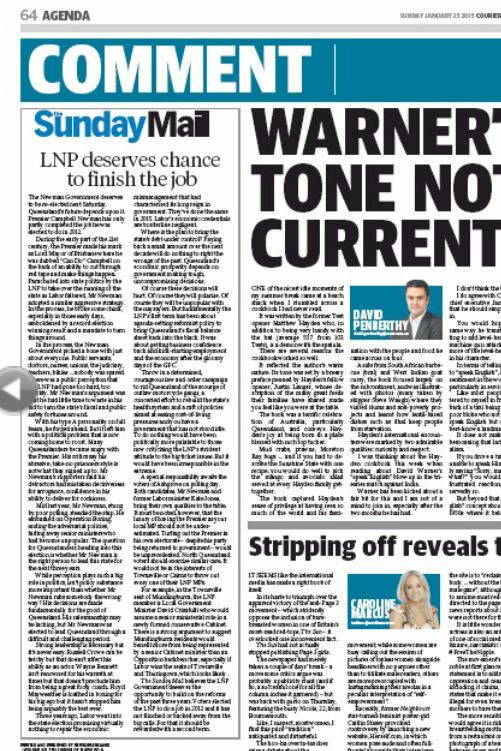 So really, he is just limiting his own sales. 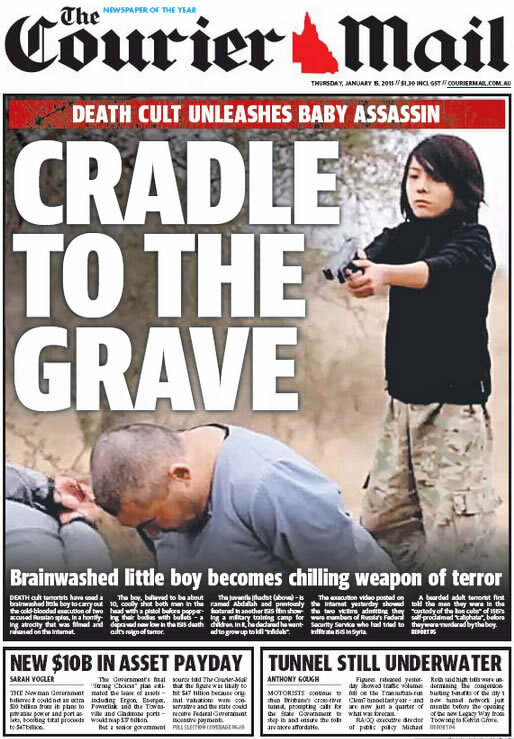 Not sure how smart that is. 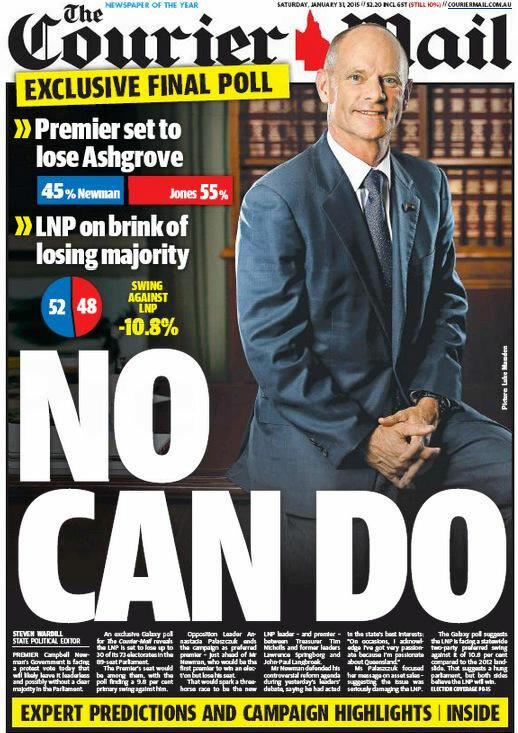 Unless he thought it was more worthwhile owning the Australian Government. 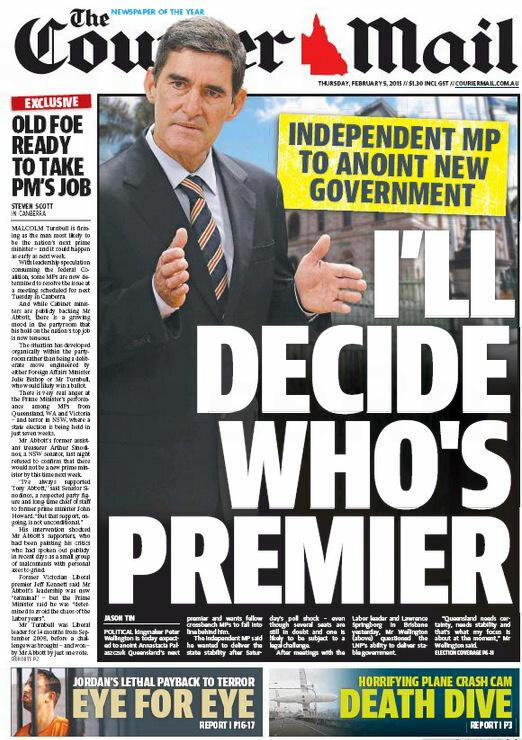 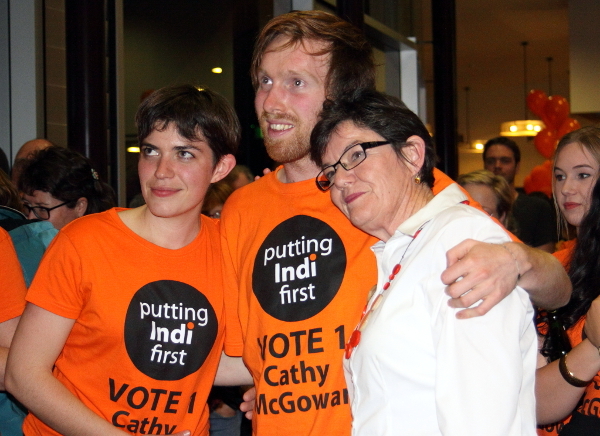 Because he also made a conscious decision that he would be the one to determine who will hold government in Australian States and the Commonwealth. 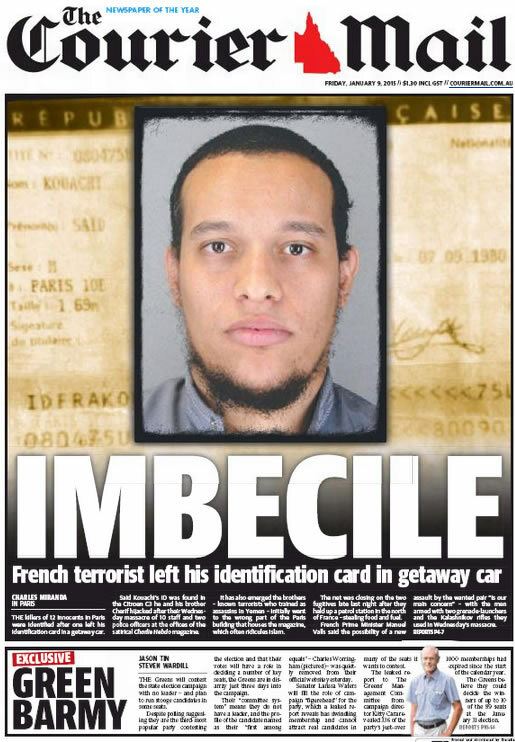 And of course, he votes Republican/Tea Party – cos he’s an American. 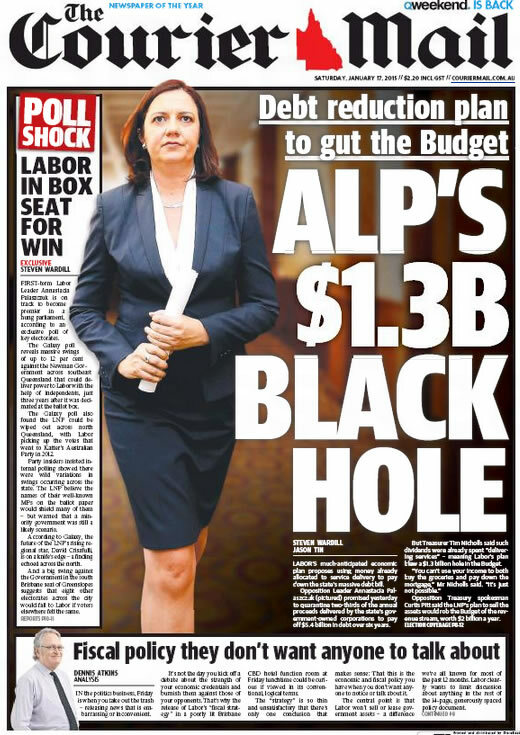 We need to keep pointing out how offensively right wing Murdoch’s press is, and make sure no-one accidentally buys any of it. 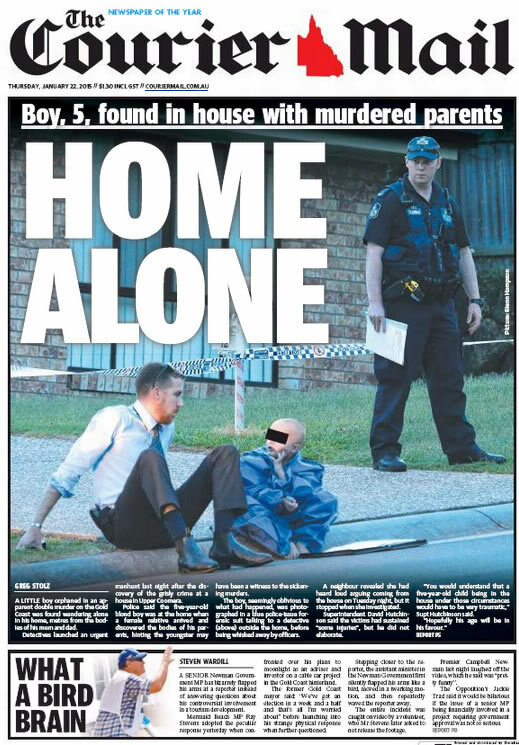 That list of the Courier Mail headlines is a magnificent illustration of how far ‘journalism’ has fallen. 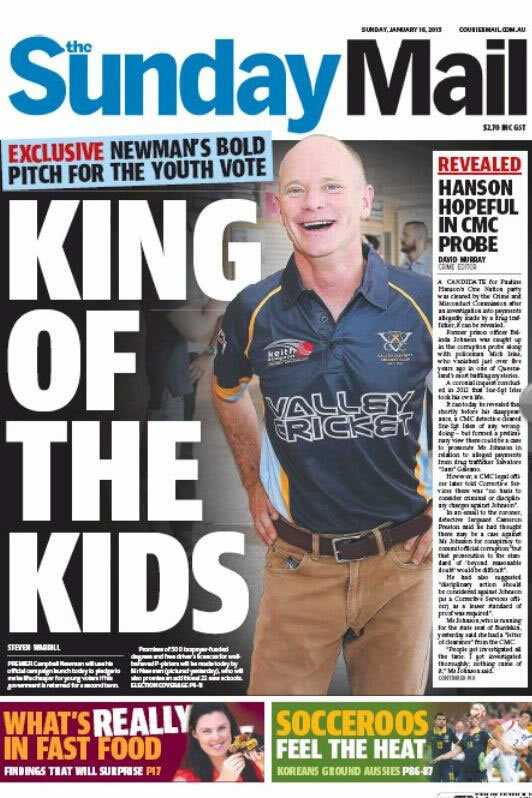 It should be used by teachers of journalism to show how the process can be corrupted. 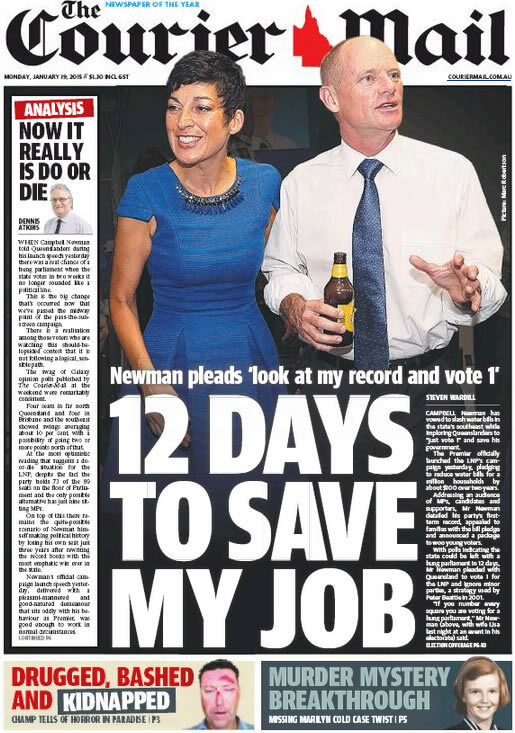 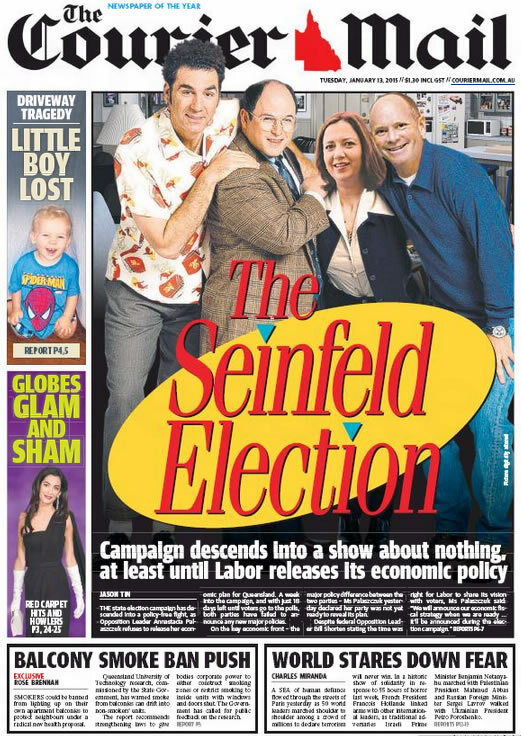 And that should be the only legacy of the Courier Mail.